Jimmy Farrow is stepping down as IDTTL Treasurer and Championship Secretary after 12 years :( I am sure that you will pass on your thanks to Jimmy for all his hard work over the years, the good news is that he will still be playing! Ooossa! We are very fortunate that James Maidstone has offered to take up the role of Treasurer, in the addition to his new role of Press Officer. This does however, still leave us with the vacant position of Championship Secretary. If anyone is interested in this role please let a member of the committee know! Britannia Swifts win K.O. Cup A close and exciting evening of table tennis saw Britannia Swifts overcome Pickwicks Stowmarket â€˜Aâ€™ on Wednesday evening to win the Ipswich & District Table Tennis Leagueâ€™s Knock Out Cup. The contest produced some exciting, entertaining table tennis, with the 2 teams battling hard all evening.It was â€˜nip and tuckâ€™ for the first 5 games with no more than 1 point in it, then David Gough of Pickwicks gave them a 7 point advantage at game 8, however Swifts were not to be overcome and came back strongly to gain a 2 point advantage after the doubles section (game 12). Swifts team of Sylvain Floury, Martin Tomes and Kelly Yungyounpakman then played decisive games to gain a 19 point lead after game 17. Pickwicks managed to reduce this to 15 points but, despite great play by Jimmy Tindle, Mark Cook and David Gough, they could not close the gap further, Britannia Swifts winning by 269 points to 254. Notice of the 2019 IDTTL AGM: Wednesday May 22nd, 7.30pm at the Rosary Club. I am sure that you will all join us in welcoming James Maidstone to the IDTTL Committee as Press Officer! If you have any Table Tennis related news, please send it to James. If you are also interested in joining the committee please get in contact! The final of the Handicap Cup has been arranged for Wednesday 3rd April at Britannia Table Tennis Club. This years final is between Britannia Swifts and Pickwicks A! Spectators welcome. Congratulations to both teams for making it to the final! We are missing an old handbook from our files, Do you have the IDTTL handbook from 1977-1978? If so, please let us know! 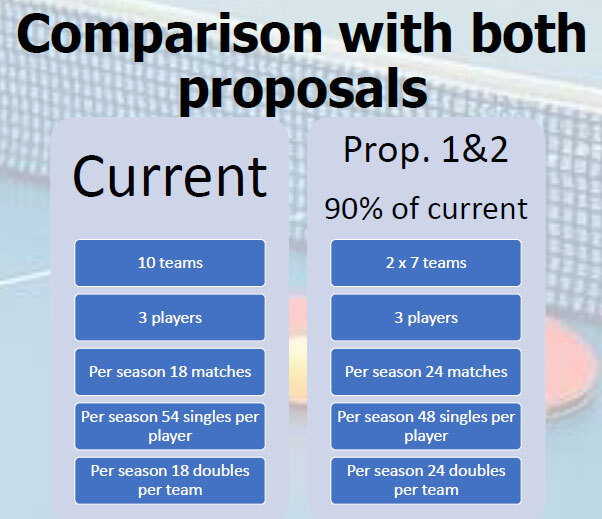 It was 18-22 (55%) against Proposal 1 (8 team divisions) and 3-37 (92%) against Proposal 2 (7 game matches). The Ipswich & District Championships! The deadline for entering the 2019 Ipswich & District Championships is the 31st January!  Click the link on the left hand side to enter your details. If you are able to offer assistance setting up the hall or over the weekend, please note this on your entry - all help gratefully received! Just to clarify Club Secretaries can vote in or out for both the new proposals. Both proposals could also be voted in together. 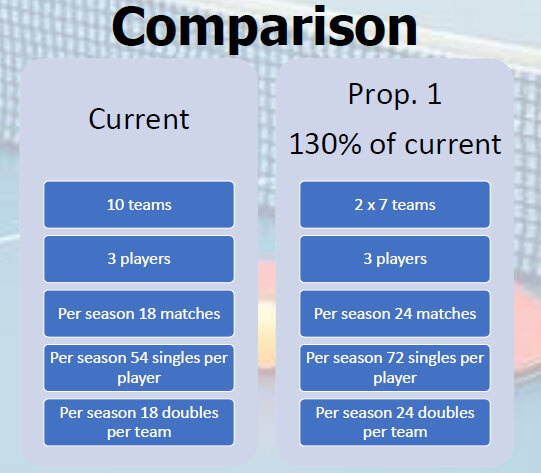 We will revert back to current league format if neither proposal is voted in. Our aim will be to have 1 blank week for each division each half season. The Championships will base their divisional competitions on the first half of the season results. The Championships divisional competitions will be renamed Band 1, Band 2 and Band 3 respectively. Team Registrations are to remain the same for the complete Table Tennis season, September - April. Something to play for all season round. It keeps the Premier division stronger. It keeps every division more competitive. More opportunities for lower league players to play up. Playing different players, following promotion/relegation. Matches in the first half of the season must be completed by the 31st December. Matches in the second half must be completed by the 30th April. 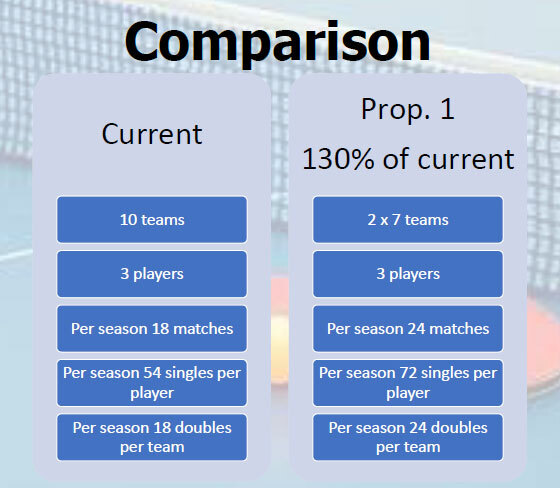 Two teams of 3 would attend every match as normal but there would be 2 singles each and a doubles. What would a league night look like? Encourage younger players to join the league. Help league players that work away or travel further. Could allow a longer social break in play. Could allow for post match team practices. Our AGM will be held on Wednesday 22nd May 2019 at Rosary Conservative Club, 7.30pm. Club Secretaries have just received an email containing two proposals for the new season. These proposals will be presented and discussed at our EGM and voted in or out. A representative from each Club must attend. All IDTTL Members are able to attend, just email: IDTTLSecretary@hotmail.com to let us know. The meeting will be held on Wednesday 23rd January at Ipswich Sports Club, 7.30pm.  As it’s the season for giving, if you’re thinking of throwing away your old and used rubbers, please instead think of donating them so that they can be used in a local Suffolk secondary school! Their young table tennis members are very keen! Please contact idttlsecretary@hotmail.com to arrange collection. Thank you!! Well done to all teams through to next round of the Handicap Cup. I have revised the handicaps and these have been sent to all team captains. These matches should ideally be completed by mid January, as with some team members away for the break it may be difficult to fit them in before January. Join us in welcoming two new members to the IDTTL Committee! All of the first round Handicap Cup matches have been played except for 1, which will be played next Monday. Everyone so far has enjoyed the matches, a change from league. Handicap Secretary Brian will look at the handicaps this week and post new ones if necessary in time for the 2nd round. I expect the 2nd round to be during the Christmas/New Year break! You can now enter the 2019 Ipswich & District Championships!  Click the link on the left hand side to enter your details! Closing date January 31st. For those who have attempted to upload score card photos via your phone, you may have received an 'invalid photo' message. This was due to the server rejecting photos as being too large. If this was the case, please download an app on your phone to 'resize photos'. After installing the app, resize the card photo to approximately 600 by 400 and then repeat the score card photo upload. For a trial period we are allowing teams to upload photos of their match results. You may do this either after emailing the results in the usual way and then selecting the button to upload the photo on the last page, or by selecting the 'Send Results Card Photo' on the left hand navigation menu. Note that using the menu method requires the result to have been entered earlier, ie. you can also upload photos of matches played at the start of the season. Only results from the current season can be uploaded. Please obscure any signatures on the result card (there is no real need to actually sign the cards at present) prior to taking the photo. You may either take a photo or scan them in them in. Only JPG files will be accepted. Score card photos will be displayed once they have been validated, usually within 24 hours. Please be aware that this is still a trial and may require a little time to resolve any bugs/features that may have bred during the coding process! The Draw for the 2018/2019 Handicap Cup has been made and can be found in the left hand side tab on our website. Also available are the score cards and rating sheets which can be printed. A reminder email about entering the Handicap cup has been circulated to all Club and Team Secretaries. Deadline for entering is Friday 12th October. If you need further information please contact Brian Blagden, the IDTTL Handicap Cup Secretary. Part-time player required for Pickwicks, playing at Baylham Village Hall in Div 3. Sandwiches are provided at home matches and annual subs are around £40 (cheap and cheerful).Anyone interested please contact Mike Chenery (07763 469045). Britannia Flamingos have withdrawn from the league. Premier teams should reprint their fixtures. Advance notice of this season's Championship dates: Saturday 16th and Sunday 17th March at Kesgrave Sports Centre. £7 entry fee covers all events. Handicap cup information has been circulated to all Club and Team Secretaries. If you need further information please contact Brian Blagden, the IDTTL Handicap Cup Secretary. 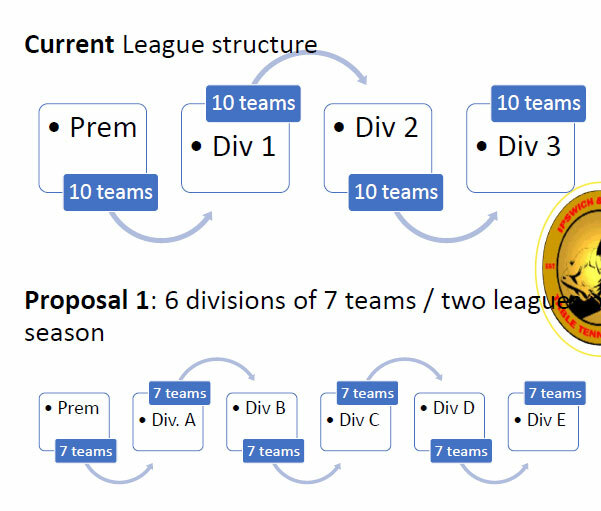 The IDTTL Committee have decided that the number of divisions should remain the same for the forthcoming Season. The relegations/promotions have been made with the main objective of trying to achieve equal numbers in each division after team withdrawals and new additions. The Season will start the 3rd week of September with the fixtures to follow. PLEASE NOTE: THE TEAM NUMBERS BELOW ARE NOT THOSE USED TO CALCULATE THE FIXTURES, but show the finishing positions from last season. As a reminder Team Secretaries must provide a email address and all players must have an ETTA membership! In addition, the Council have put new tables into Bourne Park and St Augustine's Rec, to add to the tables already in Christchurch Park! The Chairman welcomed and thanked all those present for attending. All Clubs were represented. Presentation of the Jim Kenworthy Award for most improved Junior to Gracie Edwards. Gracie won the Ipswich, Clacton, Chelmsford and Colchester Ladies titles. The Trophy is to be found. - 43 teams entered in the league this season. - Congratulations to Hadleigh A for winning the Handicap Cap. Thanks to Brian Blagden for again running a successful Handicap Cup and for Sean Gridley for stepping in. - TTE have increased their affiliation fees from £14 to £16. - Email addresses have been requested from all Team Secretaries for the forthcoming season. - Acknowledgment of the work that the committee do and highlight on the support that is needed for forthcoming season. A particular mention for Jimmy Farrow for his work as treasurer and the work that he and Michael Wright do to ensure smooth running of the Championships. - Entries down to 67 players from 90 at the Corn Exchange. Particularly low entry from Div 3 again. - The light was an issue in places, but noted this was the same at the Corn Exchange. - Location of Kesgrave and prestige of the hall was noted. It was considered that the League may hold the Championships again there. - It was also noted that the practicality of Kesgrave Sport Centre, with the tables already there, meant setting up and packing away was much easier for the organisers. - Ran through the notes to the accounts. - League finances have sufficiently improved since switching to Kesgrave for the Championships. - The league can then look to deploy these funds for the benefit of the league, if clubs need help with improvements to their facilities requests can be made. - Reiteration that sponsorship levels are not what they once were. - Cancelled matches must be acknowledged by both teams, rather than a one-way communication. The Doris Fox Award: not awarded, no nominations received. Winners can chose their prize (scoreboard, net, barrier..) as opposed to receiving trophies. Runners up were presented with match balls. Andrew Mann is stepping down as current League Secretary. Clair Westlake to be elected as League Secretary. No opposition to this from the floor. Request made for a Chairman. Nobody forthcoming to fill vacant positions. Martin Tomes spoke to the floor about National Table Tennis Day, seeking volunteers. Discussion about St Margarets B playing two strong players, that were too good for the Division. Whilst this was unsatisfactory they have been promoted and players should be able drop down if they wish. We don’t want to discourage players. A request from the floor that the AGM date is set earlier. Request considered reasonable. It was noted that there is a lack of contact details on the IDTTL website. These details have had been emailed around. Addresses are to be removed. A suggestion of players could play for more than one Club allowing them to play in two divisions. This was considered a potential conflict of interest. Composition of the league was discussed as the League may be losing a number of teams. Once the team numbers have been confirmed the Committee to discuss and finalise league structure. Pickwicks Stowmarket are looking for players, this has been put on the League website and on facebook. The number of junior boys entering the Ipswich Championships had dropped considerably. It was raised that holding the Junior events on a Sunday morning may increase entries. Ipswich Town Football Club and other table tennis fixtures to be considered before a date being arranged. Steve Branton raised the recent GDPR regulation. The committee to look at the league compliance. Phoenix TTC has two tables for sale. Please see sale notice Here. The 2018 AGM will be held at Rosary Conservative Club on Wednesday 4th July at 7.30pm. The following waiver of ETTA Rule (2003/4) 57.1 is to allow the staging of handicap competitions, hard bat tournaments etc. The waiver is not intended to cover the normal league competition, only an "additional competition". Under ETTA Rule (2003/4) 57.1 all Competitive Table Tennis must, subject to any waiver granted, be played under the ETTA Approved Laws of Table Tennis, which are at present as set out in this leaflet. (2) by restricting the type of racket covering or by otherwise diverging from the normal requirements as to equipment." We cannot run a 'league' type event, it must be knock-out. The event must come second to the main 11 pt league - this effectively means that players must be registered and involved in the main league. Being a regular cleaner of his bat, the Registration Sec' was challenged the other night for cleaning his bat between games of a match. In such a situation there's only one person to ask... Chairman Bert with his umpire blazer on. Bert ruled that there is no regulation against cleaning your bat. Footnote: The magic cleaning fluid was none other than good old Suffolk tap water bor. The three week grace afforded teams to play outstanding matches at the end of the season will be enforced so that matches played after that date will not count for the final league table. The Ipswich league is currently trying to increase the number of people playing the league, especially those of a younger age group. Players usually enter the lower divisions of the league at an age of 13 - 14, however, by that time they will have been playing non-league Table Tennis for a couple of years and the earlier they start the easier it is to improve. Having said that, the league welcomes players of all ages. In the summer of 2000, the ETTA decided to follow the ITTF ruling on using a larger 40mm ball, as opposed to the existing 38mm ball. If you are just starting or about to get into playing again after a break, you might want to check you're using the right size. The larger ball is easier to see and is slightly slower. Great for the old'ns!. Another rule change of note for those who haven't played for a while, is the one concerning bats and the rubbers. Without getting into the finer points, it basically means those playing league and competition games have to play with a Red rubber on one side and Black on the other of the bat. If you are a pimple rubber user, you will need to check the current legal pimple types, (the old grass type pimple is out!). Still trying to perfect that ultimate serve that no one can return? Watch out because the ball has to be visible to the opponent for the whole of the serve. No dangling the free arm in front of the ball! Think the 40mm ball is big?. In Japan 44mm balls are making an impact - will we see the same? Do you keep your tracksuit on until you are properly warmed up, i.e about the middle of the first game. Soon you may have to start the warm up clothed in the manner you wish to complete the whole game.